It’s surprising how often a brilliant idea is missed out on until years after the fact. In this case the concept was seen publicly within ten years, but the brilliance of the inventor has been appreciated once again after 110 years. It’s a color movie which was filmed around 1901 or 1902 but it sounds like the reel wasn’t shown in its full color grandeur until 2012 when the National Media Museum in the UK started looking into the history of one particular film. The story is well told by the curators in this video which is also embedded after the break. The reel has been in their collection for years. It’s black and white film that’s labeled as color. It just needed a clever and curious team to put three frames together with the help of color filters. It seems that [Edward Turner] patented a process in 1899 which used red, green, and blue filters to capture consecutive frames of film. The patent description helped researchers put image those frames — also using filters — to produce full color images like the one seen above. The press release on the project shares a bit more information, like how they determined the age of the film using genealogical research and the fact that [Turner] himself died in 1904. The process didn’t die with him, but actual evolved and was exhibited publicly in 1909. This, however, is the oldest known color movie ever found. It’s just as much color as a DLP projector or tv. When reading the Article, that’s what first came to mind DLP. This was the first “DLP” projector. Great Link RB. I think RB’s comment was in reference to the title of this being “the First Color Movie”. This one was shot and projected using the same “color” process, while others before that used tinting or hand painted film. see also Prokudin-Gorsky – http://en.wikipedia.org/wiki/Sergey_Prokudin-Gorsky. Admittedly, the finished images you see have been cleaned up a lot, but it’s still fantastic to see the level of detail. From the days when men were real men, women were real women, and anything worth doing was pretty much a hack. “men were real men, women were real women” In other words, when sexism was even worse than it is today. was/Is it really? Men and women aren’t and will never be the same. They don’t have the same needs or demands either. Demanding no differentiation is almost as bad as demanding no free choice. Do not confuse equal rights for men and women (equality) as saying Men and Women are the same. Surely they both deserve equal rights ? Each and every person you meet aren’t and will never be the same. Does that justify treating each one differently without getting to know them? No one demands no differentiation. Equality is about allowing each person to determine what differentiation they require for themselves, and not allowing other people to determine it for them. I’ll never complain I can’t do something with the “primitive” tools I have again. 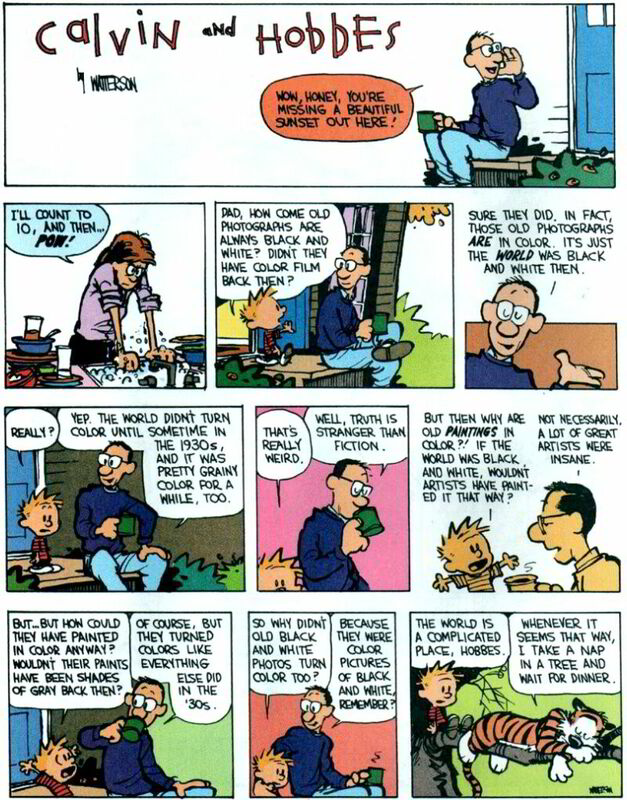 Makes me think of this “Calvin and Hobbes” page. Looks like they simply overlaid three images though their appropriate color filters. Seems like what they really needed was a temporal convolution kernel that could sum up the colors form 3 frames but apply them to a single frame. Seems like that might cut down on the single-color edges seen in the moving shots. For even better restoration, you could convert each frame’s pixels to motion vectors so you could track each pixel’s color across a moving average of the color-spaces and frames. There’s no reason the fringing couldn’t have been dealt with in post on the Autodesk Smoke system we’re shown. I used to work for the post house featured and there used to be a lot of talented film people there who would have relished this challenge. I guess we’ve all gone our separate ways now. However, for authenticity they’ve shown it exactly as it would have been projected which is probably the ultimate aim of the project. Very cool. This is how colour video was sent from the Apollo missions, using a B&W camera and a rotating colour filter. If you look at the extensive film from Apollo 13, when people move, you can see the colour fringes (similar phenomenon to interlaced video tearing, but the tearing is in colour). Everything old is is a little less old again, I suppose!